In past posts, I talked a bit about video decoding in VLC, particularly using the GPU (your graphics card’s processor) to decode frames instead of letting the software do all the work. My previous posts mostly revolved around the fact that this did not yet work in the release candidates of VLC 1.1.0 (which will hopefully be released soon). There is good news however! 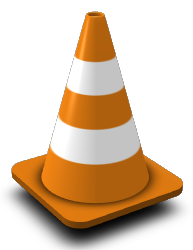 Last weekend, the bug in VLC was fixed which made the player crash as soon as the VAAPI functions were called. My updated packages (32-bit and 64-bit) for vlc-1.1.0-rc3 are available now, with the patch included, and indeed I have no more crashes. Get those new RC3 packages and enjoy! So, what is this GPU supported hardware decoding of video and why is it beneficial? High Definition video has become a de facto standard on the internet, and lots of home video recorders save in HD format too. Playback of a HD video on your computer will stretch the limits of what your CPU can do… resulting in stuttering playback (dropped video frames) or display artefacts because the CPU can not keep up. This is where the Video Acceleration API (VAAPI) originally drafted by Intel, and adopted by other hardware vendors (Nvidia and Ati of course) comes into play. VAAPI is a software interface which provides access to hardware accelerated video processing, using your computer’s GPU which is very much suited for computationally intensive operations. For instance, owners of a Nvidia graphics card will notice that VAAPI-supported HD playback will drop the CPU usage from 100 to 30 or less percent. libva: your computer will at least need this one. This is the library which exposes the VA API and adds the driver which VLC will use if your graphics card is an Intel one. vdpau-video: this is only needed if your graphics card is an Nvidia. Vdpau is Nvidia’s own acceleration API and this package adds a VDPAU backend to libva. xvba-video: this is only needed if you own an Ati-powered graphics card. This package adds a XvBA backend to libva. Unfortunately (for you) I do not own an Ati card, so I can not compile this software into a Slackware package. Get the sources here and compile them yourself, after you installed my libva package. It depends on your hardware, how good the support for GPU-accelerated video processing is. An Intel card can only accelerate MPEG-2 video, whereas Nvidia and Ati cards will also support acceleration for MPEG-4/H.264/VC-1 video formats. Note that hardware-acceleration is not limited to HD video. VAAPI will for instance be beneficial to Atom-powered netbooks too, their Intel graphics will allow fluent full-screen playback of DVDs in VLC with low CPU usage, thereby saving your battery. Posted: 14 June, 2010 in Software. This sure made a difference in dvd playback for me. I no longer hear the fans screaming during playback, and cpu usage is next to nothing. Thanks Eric ! VLC RC3 WORKS WELL with libva and vdpau-video on my Nvidia equipped laptop. Xlib: extension “XFree86-DRI” missing on display “:0.0”. Thanks again for keeping your good work. The question is – as I understood the above xvba-video is for fglrx drivers. But I use opensource drivers. Could anyone direct me to similar opensource solution? The XvBA backend driver unfortunately only works with the binary driver (fglrx). The same is true for the nvidia (vdpau) backend – that one also works exclusively with the binary driver. Ok. thank you for explanations. I thought if vainfo looks for /usr/lib64/va/drivers/r600_drv_video.so, it should exist somewhere. But googling for the filename doesn’t help either. alien, on a side note, there is no need to compile xvba-video. You just have to download the ‘.tar.gz’ file, decompress it and then copy the contents of “decompressedfolder”/usr/lib/va/drivers to /usr/lib(your arch sufix here)/va/drivers/. Thanks for this excelente post, alien. Excuse me for stupid question but how to determine if vlc really uses GPU-acceleration? What video output module must be set in vlc? I have 8600GT, NVIDIA-Linux-x86-195.36.24 driver, vlc-1.1.0-rc4, libva and vdpau-video libs installed and I see no difference in CPU usage. I have the same issue as valgors. I have a 9600 GT card, Nvidia 256.29 driver and alienbob’s libva, vdpau-video, vlc 1.1.0 rc4, ffmpeg-0.6 packages. I checked with cat /proc//maps and libva is not loaded neither by vlc nor by ffplay. With smplayer the CPU usage is 6-7% while with vlc it’s 40-60%. I had forgotten that I had been editing the .vlcrc file, manually enabling hardware acceleration before it was available as an option in the GUI.. Thanks for this post Eric! There is also another dependency (at least, on Slackware 13.1): FFMpeg with VAPI enabled; otherwise, VLC does not allow to enable GPU acceleration. An additional ffmpeg dependency would be very strange – because I built VLC with an internal ffmpeg library that has vaapi enabled. I will check when I get back home. I had an old version 0.5 of FFMpeg. Compiling VLC 1.1.0 with that library I get the message: “LIBVA found but /usr/include/libavcodec/vaapi.h does not exist”; after the compilation I get a version of VLC with the “GPU acceleration” checkbox unchecked and grayed out. Now I have installed FFMpeg 0.6 compiled with –enable-vdpau and VLC 1.1.0 recompiled with that library makes available the GPU acceleration. My package for VLC does not have that FFMPEG issue. I always build on a clean system. It is perfectly safe to use the pre-compiled package.